Preparing food in a pressure cooker is not only efficient, fast and safe but also retains most of the nutrients and makes your food tastier. Although many people still think that pressure cooking is a rather new concept, the first pressure cooker was actually invented 1679 in France. Needless to say that this one was quite different from today's pressure cooking technology. This first model was more an airtight pot or cooker that used steam to produce pressure to raise the water's boiling point which resulted in a much quicker cooking process. It took almost 200 years until the concept caught on in Europe when a German company started to manufacture the first cast iron pressure cookers in 1864 and half a century later a company in Spain filed the first patent for their pressure cooker in 1919. In the United States, the first pressure cooker was introduced to the consumer in 1939 at the New York World's Fair. These days - the process of manufacturing pressure cookers has, of course, reached a point where those products are not only extremely safe and reliable but also utilizing today's technology and safety standards. 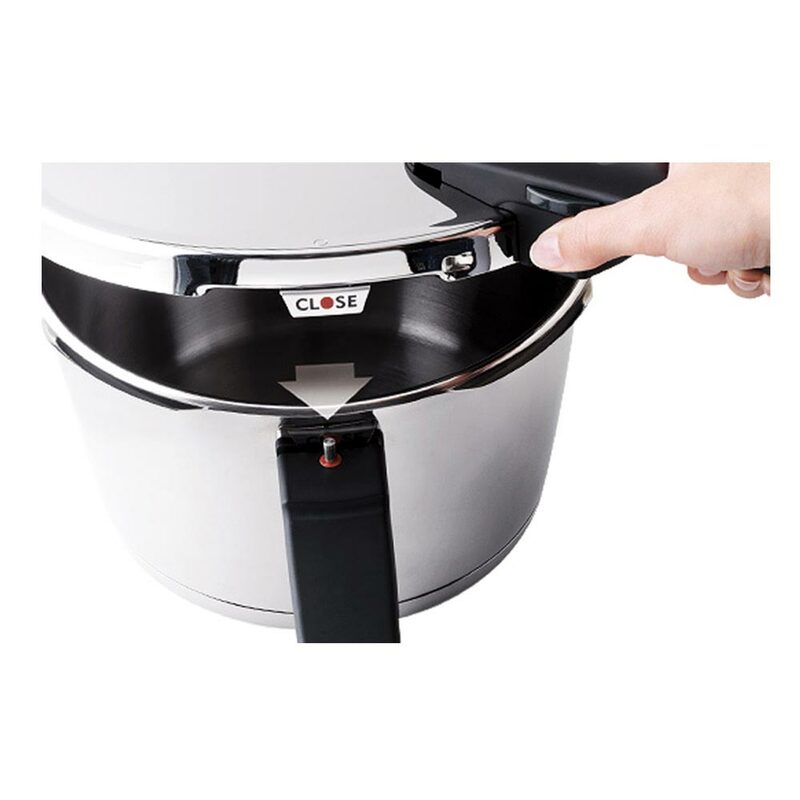 Many manufacturers offer many types of pressure cookers and the reason why we selected a pressure cooker from Fissler lays in the companies reputation and 165 years of history. It's quite difficult to find a better name in the world of superior stainless steel cookware then Fissler and, combined with the quality mark "Made in Germany", is hard to top. Founded by Carl Philipp Fissler in 1845, Fissler developed their first Pressure Cooker model in 1953 and already incorporated a multi-setting control valve into this early system. Today, it requires more than 63 individual steps to produce a single Fissler pot which is then scrutinized and certified by one of the most thorough certification companies in Europe, the DEKRA. Fissler still manufactures its high-quality pressure cookers at their location in the beautiful town of Idar-Oberstein in Germany. Fissler's Vitaquick Pressure Cookers are manufactured using heavy gauge, hygienic 18/10 stainless steel, UL listed and incorporate multiple safety mechanisms including a maintenance-free automatic pressure valve. We found them to be very unique compared to other brands in that they are extremely silent with no steam, no smell, no rattling or hissing during the cooking process. 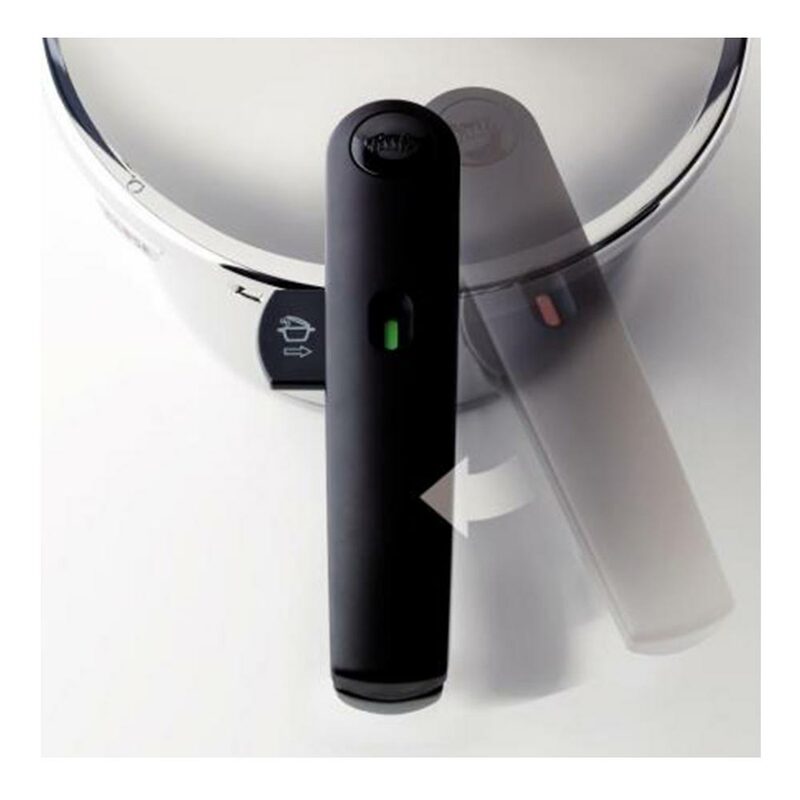 The large indicator rod has two convenient settings for either gentle or speed cooking and is very easy to read even from a distance. Fissler fitted this new model also with an upgraded removable handle. This handle features an auto-locking system and visual indicator. So the handle actually indicates whether the cooker is closed correctly and will also confirm the secure closure of the lid with and audible "click" sound as well as a special color display switching from red to green. 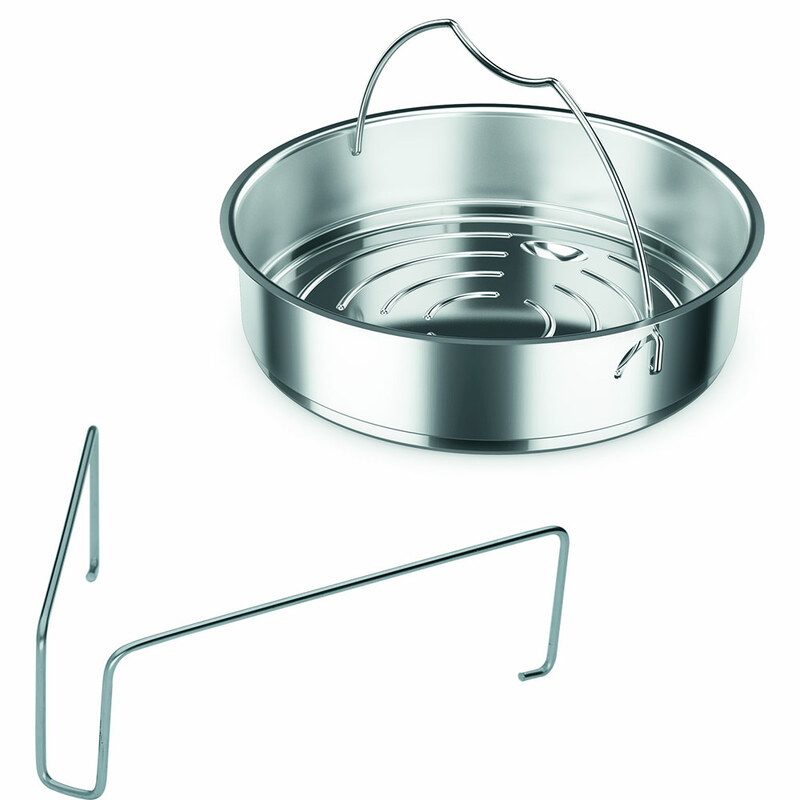 The last confirmation that the lid is securely closed is actually provided by the cooker itself since the cooker will not allow building pressure if the lid is closed incorrectly. A great feature that most people don't think of but will miss once they need it is the really convenient min/max measuring scale on the inside of the pressure cooker. This takes the guesswork out and allows you to measure directly in the pot. When it comes to storage, Fissler solved the problem by making the cookers slightly conical shaped. This way they easily fit into each other for scratch-free space saving storage. Last but not least, the probably most important part of any cookware = the base. Fissler made it pretty easy for us to choose their model considering all those features. 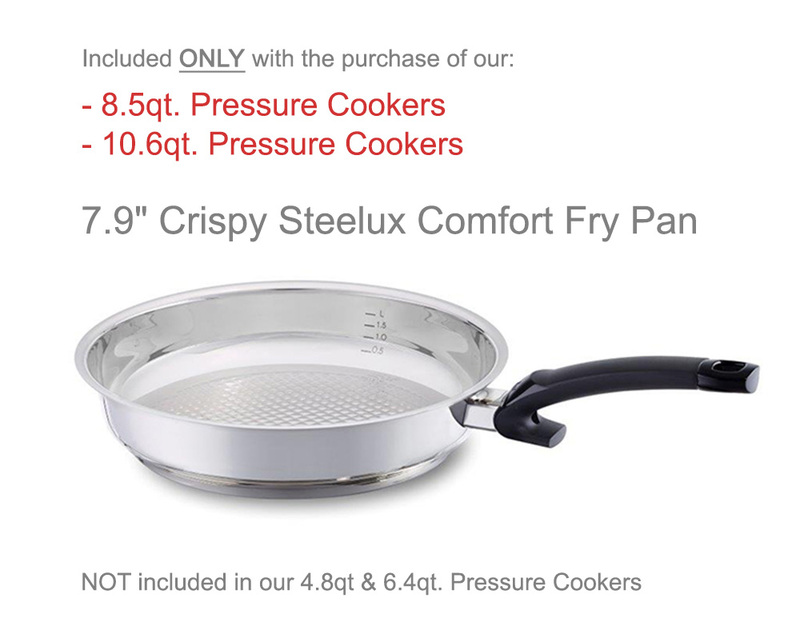 But we would have probably made the same decision simply because of Fissler's proprietary Cook-Star all-stove base that they use for their pressure cookers. Every cookware is only as good as it's base. If the base gives up or warps you are losing heat conductivity, efficiency, and cooking capabilities. 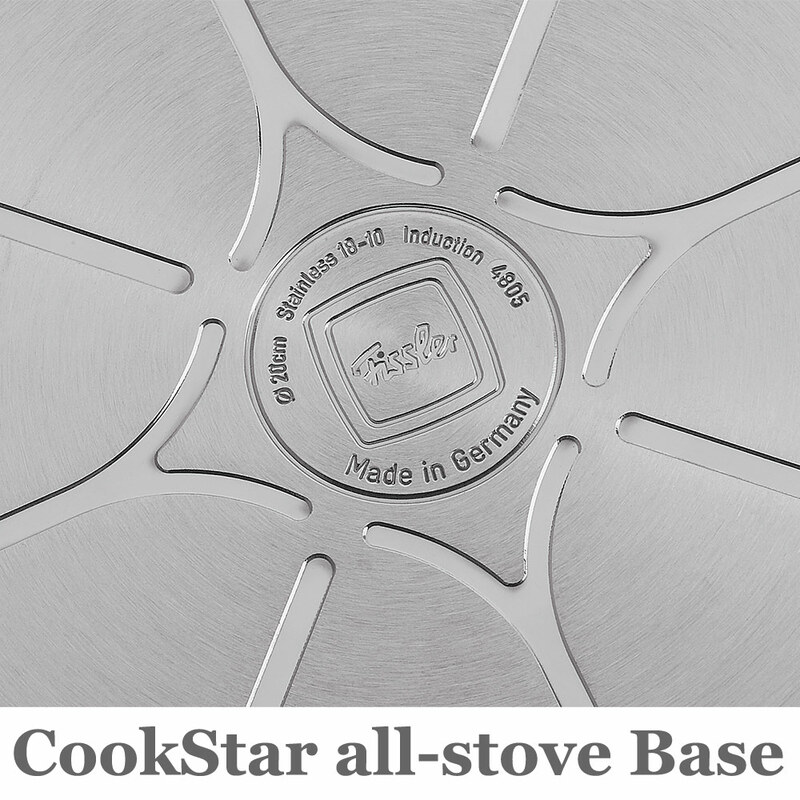 Fissler's "CookStar" all-stove base will definitely not give up and is actually guaranteed to stay perfectly even and flat forever. This ingenious base is a 6mm thick aluminum core completely encapsulated in 18/10 stainless steel. This thick core ensures absolutely even heat distribution and superior heat storage. Now we found many other cookware manufacturers that feature some sort of aluminum core in their cookware. The problem with those was that they are usually not thick enough and, more importantly, are usually not manufactured in a way that no air pockets and tiny holes occur within the base which ultimately creates hot-spots. So it is not only important how thick the base is but also how it is manufactured. Fissler uses a rather extensive process to manufacture the base for their cookware. The layers of the base are heated and bonded by an impact of over 1,500 tons of pressure creating one single piece without any holes or air pockets as opposed to other manufacturers that choose to glue or weld those layers. Fissler also manufactures the base slightly concave to ensure that the base will be perfectly flat on your stove when heated and incorporates expansion joints allowing the aluminum core to expand without ever affecting the outside stainless steel. Fissler guarantees this base for life and it is almost needless to say that this high-quality base is suitable for all kind of stoves even induction. Every single piece of the Fissler Pressure Cooker is 100% made in Germany. Q: Does my pressure cooker require any maintenance? A: Only the Gasket which is subject to natural wear and tear and very easy to replace. Gaskets have to be replaced after approx. 400 applications or after two years at the latest. Q: How do I find parts for my pressure cooker? A: The manual of your pressure cooker will provide you with information of all parts that are available for your pressure cooker. 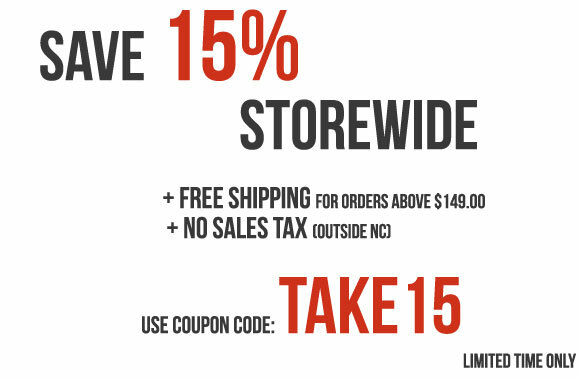 We either have them available in our store or will provide you with information about where to get them. Q: What type of stove is suitable for my new Fissler Pressure Cooker? A: Fissler pressure cookers are suitable for all types of cooker, including induction cookers. Q: What can a Fissler pressure cooker do that a normal pot can not do? A: The higher temperature in the Fissler pressure cooker reduces cooking times compared to standard cooking by up to 70%. This saves up to 50% of energy. Thanks to the removal of the atmospheric oxygen and the short cooking times, food is cooked very gently. Vitamins, minerals and flavorings are preserved better, colors remain fresh and natural flavors intensive. Q: How do I clean my new Vitaquick Pressure Cooker? A: Fissler Vitaquick pressure cookers are fully dishwasher safe including the lid. We just recommend taking the gasket out and place it in the upper compartment of your dishwasher or wash by hand! Q: When do I start measuring the cooking time with my Fissler Pressure Cooker? A: The indicated cooking time begins as soon as the setting you have selected has been reached. Q: How do I know what type of food to cook at what setting and for how long? A: In general, vegetables and fish are cooked at Setting I, and meat, potatoes, soups and similar food at Setting II. Normal cooking times are approximately cut in half with Setting I, and to one-third at Setting II. However, the exact cooking time always depends on the size and quality of the food, too. 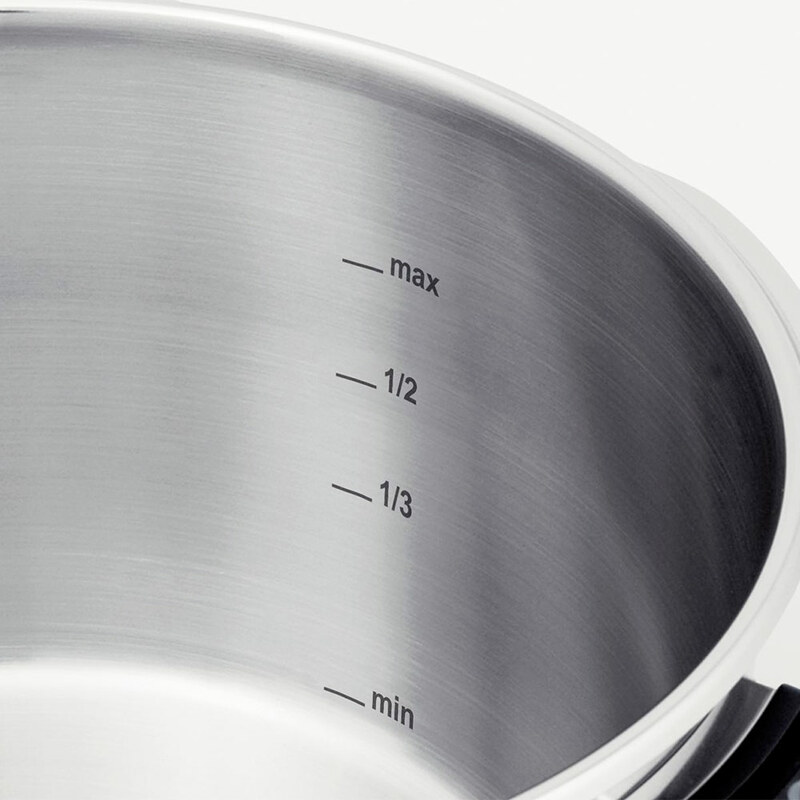 The manual booklet for your new Fissler pressure cooker will have all cooking times included! Q: Why has my Fissler pressure cooker 2 different settings? A: The gentle setting with its relatively low temperature is ideal for all sensitive foods such as fish or vegetables. The speed setting has a higher temperature and is intended for meat dishes, stews and similar types of food. 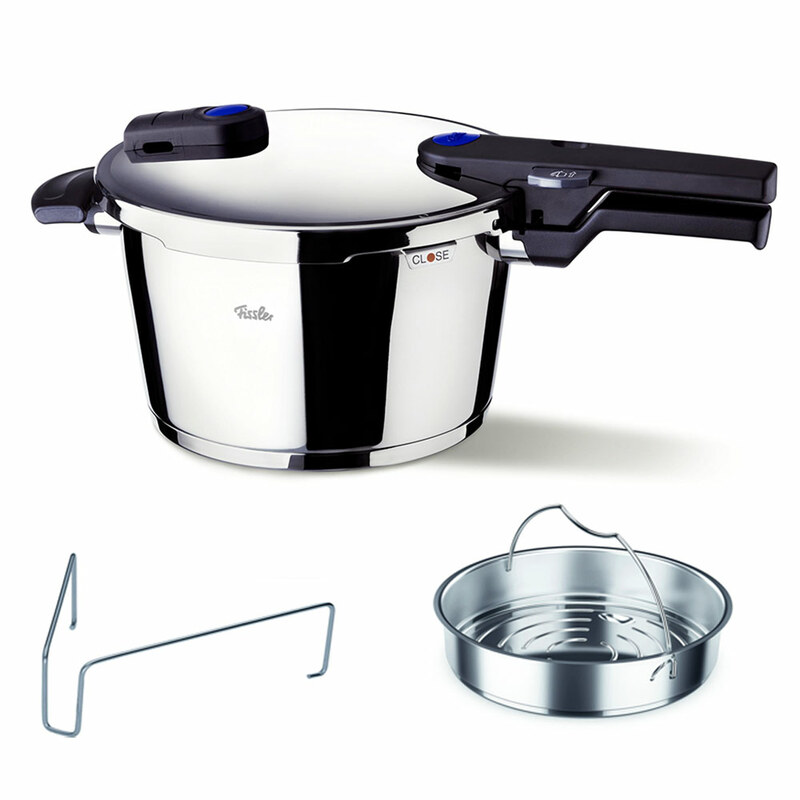 Q: What kind of accessories are available for my Fissler pressure cooker? A: There is an extensive range of accessories available allowing you to take full advantage of your new Fissler Pressure Cooker! Q: What is the best pressure cooker size for me? Q: I have seen a particular Pressure Cooker size featured in a Magazine. Should I buy the exact same size they featured or are all sizes Pressure Cooker similar. A: All sizes are the exact same great Fissler pressure cookers with all of the same features. So you can choose the size that fits your family needs the best. Q: Are there any type of food that should not be prepared in a pressure cooker? A: You should not prepare Apple sauce and compotes in a pressure cooker since steam bubbles can build which burst upon opening. Q: Can I deep-fry under pressure? A: NO - you can NOT deep-fry under pressure. Foods can ONLY be deep-fried in the pressure cooker WITHOUT the lid! If you decide to deep-fry in the cooker without the lid make sure that the pot you use is high enough to prevent burns caused by foaming or spattering oil. Q: Is it possible to prepare dishes other then stews or potato on a Fissler pressure cooker? A: Generally speaking, nearly all cooking methods are possible with a pressure cooker. You can cook or stew, steam (with inset), sauté and fry (without lid) but also defrost, boil down or strain (with insets). Q: I have stains on my pressure cooker. What happened and what can I do? A: These are generally discolorations which result from substances in the water being absorbed into the passive film of the stainless steel. Cleansers which contain a large amount of basic silicates and phosphates can also produce such discolorations in stainless steel. Adding salt to water which has not yet come to the boil can also produce deposits of salt crystals on the bottom of the pot. The salt then reacts with the stainless steel, forming little white spots on the bottom of the pot. Discolorations can also be produced if stainless steel cookware is placed on a burner that is already very hot. The discolorations can easily be removed with Fissler Stainless Steel Cleanser. Q: I think my pressure cooker is not working correctly anymore. What can I do? A: You can consult the chapter " Questions and answers regarding your pressure cooker" in your manual. If you can find a solution, please contact us and we provide you with the phone number for technical support.